Welcome to Day #10 of Chocolate and Berries Theme Week. Today's Dark Chocolate with Blackberry Sage 60% Cocoa bar was from Endangered Species Chocolate (Indianapolis, IN). This last day of Chocolate and Berries week contained berries in name only. The 60% dark bar was flavored with dried sage and "natural flavor." (What? No real blackberries? Apparently not.) However, the sage was great, the blackberry flavoring was not bad and the dark chocolate was smooth and even. 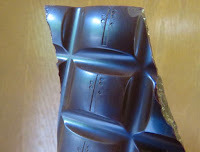 This dark chocolate bar with inclusions was Non GMO Project Verified, certified gluten free, fairtrade and vegan. 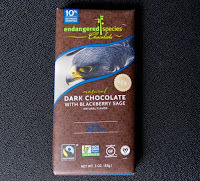 Endangered Species chocolate bars and barks each feature an animal, bird or natural setting on their packaging. Today's bar wrapper had a picture of a Peregrine Falcon—a bird of prey that has resorted in some locations to nesting on top of city skyscrapers as tall trees* disappear. The company donates 10% of net proceeds to supporting habitat and wildlife conservation programs worldwide. *Birds of prey like eagles, hawks, falcons and owls nest in tall, mature trees.